Molina has a wealth of experience across multiple sectors. Originally from India, she worked both in law firms and at the Supreme Court of India before moving to Melbourne in 2004. Once here, Molina attained a Masters in Commercial Law at Melbourne Law School and worked at Minter Ellison and Clayton Utz before moving to the Victorian Government Solicitors’ Office, where she worked for over a decade. She started her own practice in 2018 and currently holds numerous board positions, including at the AFL South East Commission, Law Institute Victoria and Graduate House at the University of Melbourne. She is also Vice President of the Asian Australian Lawyers Association. What attracted you to study and work in law? Many of my family members are lawyers and judges so I was always exposed to the legal world through dinner table conversations while growing up. Like many kids, I initially wanted to rebel against our family background, and I decided to pursue a commerce degree after finishing high school with aims of later gaining an MBA. Half way through, I became attracted to doing law after realising that half of the news in India is centred on legal issues and the actions of the judiciary, as the courts often take it upon themselves to direct the government when other mechanisms fail. I was drawn to a career in public interest litigation and felt it was important to lend my voice to issues in the community. When you reflect on your career, what highlights stand out to you most? Having had careers in two different countries, the highlights are different for each. In India, many of the public interest litigation cases I worked on were reported in the newspapers. A couple of stand-out cases include one in which I represented school parents at the High Court of New Delhi after an unjustified and unexplained hike in school fees. The Court decided to set up a committee to investigate. They found the rise in fees was unjustified and schools were required to pull them back. I also presented at the Supreme Court in a case regarding ‘ragging’ practices at colleges. These are initiation rituals, similar to ‘hazing’, which have led to many instances of sexual harassment and suicide. In response, the Court set guidelines and provided policies to colleges to limit ragging. In Australia, getting my first job at a top-tier firm was a great feeling. As a migrant, I was told by recruiters that I wouldn’t get a job at a mid-tier firm, let alone a top-tier one and was advised that I should change my profession. I persevered and it paid off. I am also proud of becoming the first Indian-born lawyer to join the board of Law Institute Victoria, and for winning awards such as the Victorian Multicultural Award for Excellence (2014 and 2016), the Young Executive and Person of the Year at the Indian Executive Awards (2013) and The Spirit of Sport Award at the India Australia Business and Community Awards (2017). Having worked across multiple sectors, could you describe any similarities and differences? I personally didn’t enjoy the crazy hours and the competitive nature of the private sector. I wanted to serve the community, which I felt I could achieve more working in government. In terms of similarities, the quality of work in the government sector is equally good, if not better, and the same skills are necessary to be a good government lawyer. I was also still working in commercial law at the VGSO, so the transactions were similar to the ones I dealt with in the private sector, just from the opposite side. I found quite a big difference in work-life balance and felt the culture in the government sector to be more inclusive. I also had a great variety of work at the VGSO. Law firms are very compartmentalised which means tasks can become quite repetitive and less enjoyable after a while, especially if you’re looking for a challenge. Deadlines at law firms can often feel quite artificial whereas I had more freedom how I went about my work and prioritised tasks at the VGSO. On the other hand, the government sector can be very bureaucratic and the private sector more flexible in that respect. I have had to put a lot of work into establishing my own practice recently, but I now have the flexibility of choosing my own hours and only pursuing work I am passionate about. I want to limit the amount of work I take on so that I can spend more time with family and focus on my community work. I am also enjoying the experience of working for myself. Could you speak about your experience working in law as a woman of colour? There are two layers to this question. Firstly, being a person of colour comes with its own trials. There is hardly anyone in the upper echelons of legal practice who has moved to Australia as a migrant and has an accent. You can find more people of colour in the profession who were born here, though these numbers are still very minimal as well. I found it difficult to socialise when I first started working in Australia because I wasn’t part of the culture my colleagues grew up in – I didn’t know the schools they went to, the TV shows they watched as children, and Friday night drinks and the footy were new concepts for me. There is an unconscious bias that some people have regarding certain backgrounds that I constantly had to face, and I had to be the one making the effort to bridge the gap between myself and others, rather than being met in the middle. Being a woman in the law adds a second layer. I had a very different experience when I returned to work after maternity leave – balancing personal life and responsibilities as a mother with legal practice can be tricky. There are, of course, additional challenges women face such as the lack of equal pay between genders. In combining these two layers, the glass ceiling for a woman of colour is double glazed. The barriers do not work separately but are compounded. Having said that, there is a lot more talk about the need for diversity and inclusion in the law and some organisations are definitely making a conscious effort, even if part of it is lip service. It is also not just diversity in gender and race that is important but a diversity of thoughts, beliefs, values and leadership that must be encouraged. Adding more women to the room means nothing if those women share the same thoughts or prejudices as the men already at the top. Running is a passion of mine – I try to make time for it at least three times a week and have competed in a few half marathons. I didn’t really participate in sport growing up but got inspired by seeing so many people running outside when I moved to Melbourne. There was a running group at one of the places I seconded at. Everyone there had done a half or full marathon, so I challenged myself to do the same. I like running because it clears my head and gives me space to think. I also enjoy going to watch sport, particularly cricket, AFL and soccer. A lot of my ‘spare time’ is taken up by my positions on various boards and community organisations. 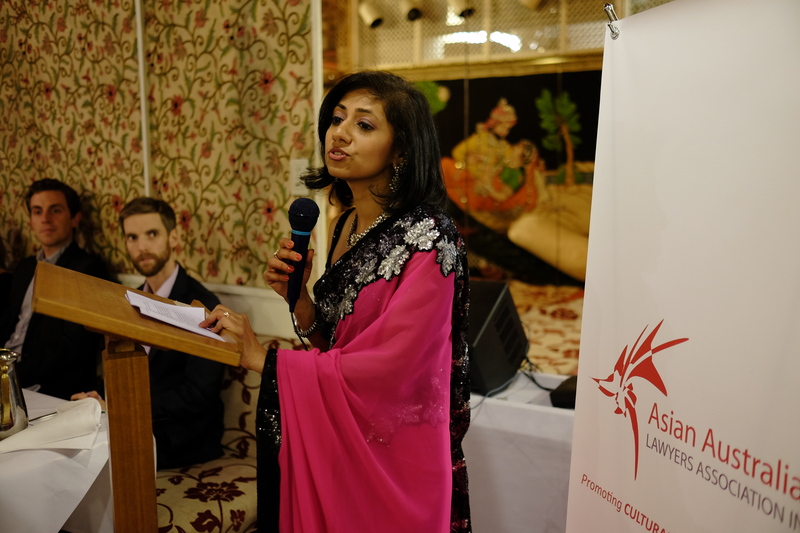 I am Vice President of the Asian Australian Lawyers Association (AALA), working to create more opportunities for lawyers of Asian backgrounds and forging links between Australia and other jurisdictions. We hold scholarship programs, mentoring programs, networking events and panel discussions focused on increasing diversity in the legal profession. I was one of the founding members at AALA five years ago and take pride in seeing it to grow from just 50 members to now over 1000 members with branches in every state. I am the Founder and Executive Director of Multicultural Women in Sport, a non-profit organisation that engages women from different backgrounds on and off the field – as players, coaches and umpires, or on the boards and committees of sporting clubs. Sport is a means of empowerment that had a big part to play in increasing my sense of belonging and wellbeing after moving to Australia. I believe involvement in sport can give women the confidence to overcome issues of isolation and depression, and perhaps also instances of domestic violence. I am also a Council Member for the Law Institute of Victoria. I am spearheading the sexual harassment task force, liaising with the Victorian Legal Services Commissioner, the Victorian Bar and the Victorian Equal Opportunities and Human Rights Commission to address sexual harassment in the legal sector. If you hadn’t pursued law, what would you have done instead? I wanted to be a fashion designer when I was growing up, but I gave it up pretty quickly because it wasn’t something my family would have taken too well – I still love fashion though. It is quite difficult to say what I would have done if not law because I could not have imagined that one day I would be running my own sporting not for profit and that I would be so passionate about increasing participation of women in sport. We sometimes develop passions later in life and I think it’s very rewarding to pursue those passions. I also think that it is perfectly acceptable to change careers later in life. What differentiates a good lawyer from a great lawyer? Passion. I think the lawyers that stand out in society are those that are doing something for the community and are raising their voice for others. A good lawyer is someone who has the skills, and a great lawyer is someone who uses their skills to follow their passion. A great lawyer works to implement the changes they want to see in the world. Having achieved so much already, what are your goals moving forward? I would love to work more in the diplomatic space between Australia and India – perhaps establish a sports consultancy firm to take Australian sport to India, as well as engage in more cross border legal work. I would also like to raise the prospect of public interest litigation in Australia to see if there is any legislation that could be developed to allow for it. And, of course, I’d like to see the changes in the legal sector surrounding diversity and sexual harassment that I have been advocating for, come to life. If you could turn back time and give a younger version of yourself one piece of advice, what would it be? To follow your heart and not what other people are telling you to do, and to be patient; it doesn’t all happen at once. I would tell myself to be resilient – other people, or sometimes even you yourself, will push you down but you must keep getting back up. I’d also remind myself to be consistent in my efforts and follow things through. Any advice for law students today? Don’t be enamoured by the big law firms as the only possible pathway. Law can lead to many different paths and even if you don’t practice law, your degree is going to be incredibly useful. Your strong analytical skills and knowledge of legislation will be important in any area of work. Don’t go with the herd mentality and have faith that you will find your own path eventually.